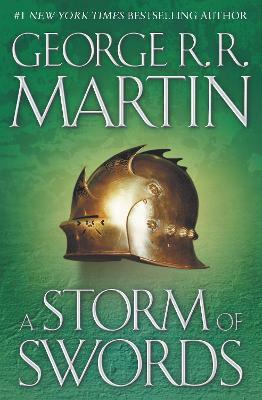 Rarely has there been a tale as gripping, or one as likely to seize the minds and hearts of a generation, as George R. R. Martin's epic high fantasy series. In A Game of Thrones, an ancient kingdom was torn by the ambitions of ruthless men and women; in A Clash of Kings, war, sorcery, and madness swept over the kingdom like a voracious beast of prey. Now, as the brutal struggle for power nears its tumultuous climax, the battered and divided kingdom faces its most terrifying invasion--one that is being spearheaded from beyond the grave. . . . A STORM OF SWORDS Of the five contenders for power, one is dead, another in disfavor, and still the wars rage as violently as ever, as alliances are made and broken. Joffrey, of House Lannister, sits on the Iron Throne, the uneasy ruler of the land of the Seven Kingdoms. His most bitter rival, Lord Stannis, stands defeated and disgraced, the victim of the jealous sorceress who holds him in her evil thrall. But young Robb, of House Stark, still rules the North from the fortress of Riverrun. Robb plots against his despised Lannister enemies, even as they hold his sister hostage at King's Landing, the seat of the Iron Throne. Meanwhile, making her way across a blood-drenched continent is the exiled queen, Daenerys, mistress of the only three dragons still left in the world. Filled with the stench of death and decay from the destructive dynastic war, Daenerys is gathering allies and strength for an assault on King's Landing, hoping to win back the crown she believes is rightfully hers. But as opposing forces maneuver for the final titanic showdown, an army of barbaric wildlings bent on overwhelming the Seven Kingdoms arrives from the outermost line of civilization. In their vanguard is a horde of mythical Others--a supernatural army of the living dead whose animated corpses are unstoppable. And as the future of the land hangs in the balance, no one will rest in the quest for victory until the Seven Kingdoms have exploded in a veritable storm of swords. . . . Brilliantly conceived and grand in scope, A Storm of Swords is the incredible tale of a world of harsh beauty and powerful magic, torn by treachery, ravaged by brutality, and consumed by greed and ambition. It portrays a war-torn landscape in which nobles and commoners, heroes and villains, the freeborn and the enslaved, all struggle to survive and to find their destinies...along with the dazzling bounty and wondrous enchantment that was once their birthright in the Seven Kingdoms. Of the five contenders for power, one is dead, another in disfavor, and still the wars rage as violently as ever, as alliances are made and broken. Joffrey, of House Lannister, sits on the Iron Throne, the uneasy ruler of the land of the Seven Kingdoms. His most bitter rival, Lord Stannis, stands defeated and disgraced, the victim of the jealous sorceress who holds him in her evil thrall. But young Robb, of House Stark, still rules the North from the fortress of Riverrun. Robb plots against his despised Lannister enemies, even as they hold his sister hostage at King's Landing, the seat of the Iron Throne. Meanwhile, making her way across a blood-drenched continent is the exiled queen, Daenerys, mistress of the only three dragons still left in the world. Filled with the stench of death and decay from the destructive dynastic war, Daenerys is gathering allies and strength for an assault on King's Landing, hoping to win back the crown she believes is rightfully hers. But as opposing forces maneuver for the final titanic showdown, an army of barbaric wildlings bent on overwhelming the Seven Kingdoms arrives from the outermost lineof civilization. In their vanguard is a horde of mythical Others--a supernatural army of the living dead whose animated corpses are unstoppable. And as the future of the land hangs in the balance, no one will rest in the quest for victory until the Seven Kingdoms have exploded in a veritable storm of swords....Brilliantly conceived and grand in scope, A Storm of Swords is the incredible tale of a world of harsh beauty and powerful magic, torn by treachery, ravaged by brutality, and consumed by greed and ambition. It portrays a war-torn landscape in which nobles and commoners, heroes and villains, the freeborn and the enslaved, all struggle to survive and to find their destinies...along with the dazzling bounty and wondrous enchantment that was once their birthright in the Seven Kingdoms.